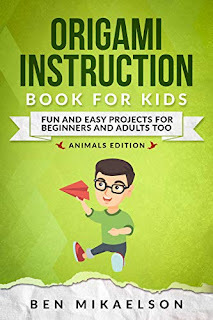 Amazon is offering the Origami Instruction Book For Kids Animals Edition by Ben Mikaelson for free as a Kindle download. In this Origami Book, we'll be learning to make colorful, sweet and even fierce animals (lions, tigers and bears, oh my!) There will be a total of 14 different Animal Origami projects. Each project has helpful pictures and well written instructions at each step to guide you and ensure you don't get lost.